“The parents eat sour grapes, and the children’s teeth are set on edge? As surely as I live, declares the Sovereign Lord, you will no longer quote this proverb in Israel. For everyone belongs to me, the parent as well as the child — both alike belong to me. The one who sins is the one who will die.' "
The exiles found comfort in their false doctrine of fatalism. Their inability to alter the cosmic events was confirmed by their hopeless situation. Indeed, Ezekiel and Jeremiah were not ignoring the fact that children tend to behave as their parents. (This truth is presented in Ezekiel 16:44; Exodus 34:6-7; Deut. 5:9) But, a child behaving like their parents is not the same thing as the children being punished for their parent’s behavior. In fact, the children are being punished for behaving like their parents. A man has the freedom to respond to his world and his God differently than his parents. Ezekiel gives three illustrations of a children making their own decisions that determine their own fate in Ezekiel 18:5-18. The Jewish captives were not innocently suffering for the sins of their parents, but were suffering the results of their own choices and lifestyle. This generation of exiles in Babylon needed to repent of their own sins. This repentance needed to begin with a correction of their own false views of God. I will not accept quotes as statements of truth simply because they are catchy, clever or cute. I will test popular slogans by comparing them to the truth and reality. 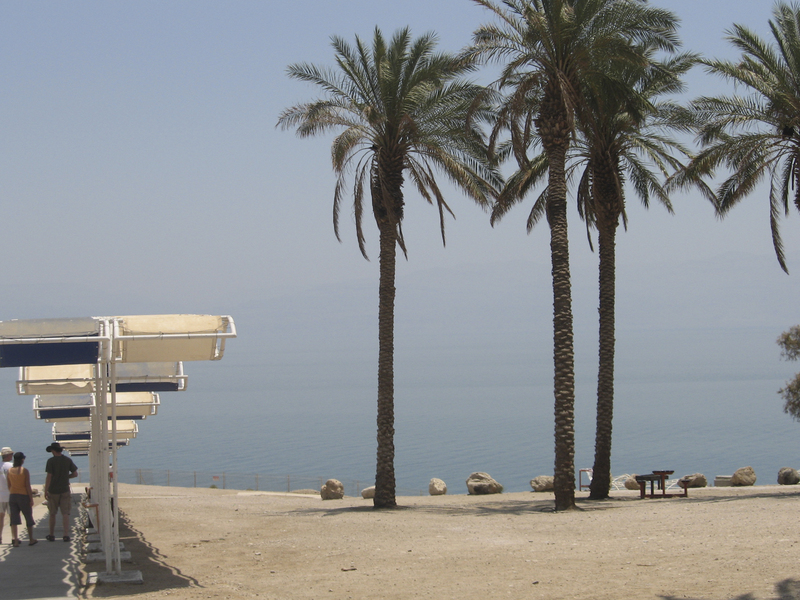 Palm trees on the shore of the Dead Sea. 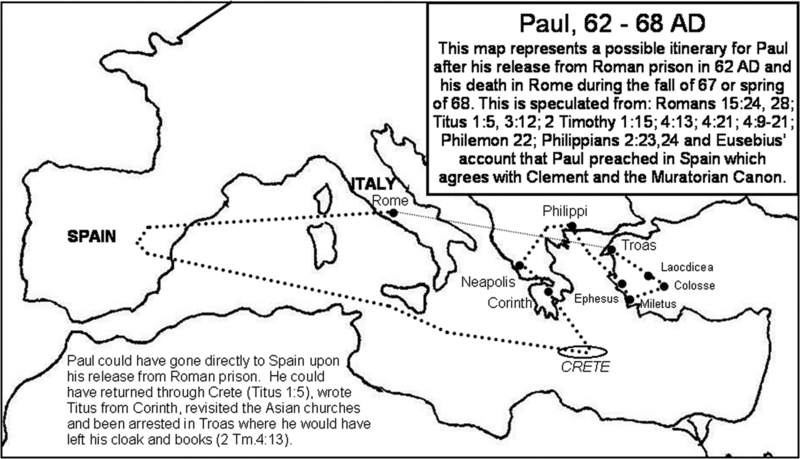 Details on a map of Paul's possible travels to Spain in the "far-west" during the years 62-68 AD as he alluded to in Romans 15:24, 28 and recorded by Eusibius which is in agreement with Clement and the Muratorian Canon. (John 7:37-39; Acts 11:16-17; Romans 5:5; This indwelling is permanent and eternal. 3. Baptizing – Baptism by the Spirit refers to the work of the Spirit in baptizing us into Christ or into the body of Christ at the point of our salvation, and it is never repeated (1 Corinthians 12:13; Ephesians 4:4, 5). 4. Gifting – Each believer is given one or more gifts at the point of their new birth. These are spiritual gifts or supernatural endowments in addition to our natural talents (1 Corinthians 12; 1 Peter 4:10; Romans 12:3-8; Ephesians 4:11-13). 5. Filling – The filling of the Spirit requires the believer to be obedient, walk in the light. 6. Teaching – The Spirit is in the believer to reveal truth and teach them (John 14:26). 7. Leading – Leading the believer in truth and God’s plan (Jn.16:13; Rom 8:14). 8. Assuring – The Spirit will testify to you that you are a believer and a child of God (Rom. 8:16; 1 Jn 5:6-10). 9. Praying – The Spirit, along with Jesus, prays for us (Rom. 8:26; Eph. 6:18). 10. Sanctifying – Sanctify means to set apart. The Holy Spirit sets us apart as God’s possession and for God’s purposes (1 Cor. 1:2; 6:11). A pool in ancient Samaria is likely the pool where Ahab’s blood was washed out of his chariot as recorded in 1 Kings 22:37-38. "Folly is bound up in the heart of a child, but the rod of discipline will drive it far from him." 7 In the twelfth year of King Xerxes, in the first month, the month of Nisan, the pur (that is, the lot) was cast in the presence of Haman to select a day and month. And the lot fell on the twelfth month, the month of Adar. “Prepare your shields, both large and small, and march out for battle! What do I see? They are terrified, they are retreating, their warriors are defeated. They flee in haste without looking back, and there is terror on every side,” declares the Lord. “The swift cannot flee nor the strong escape. In the north by the River Euphrates they stumble and fall. “Who is this that rises like the Nile, like rivers of surging waters? Charge, you horses! Drive furiously, you charioteers! March on, you warriors—men of Cush and Put who carry shields, men of Lydia who draw the bow. But that day belongs to the Lord, the Lord Almighty— a day of vengeance, for vengeance on his foes. The sword will devour till it is satisfied, till it has quenched its thirst with blood. For the Lord, the Lord Almighty, will offer sacrifice in the land of the north by the River Euphrates. “Go up to Gilead and get balm, Virgin Daughter Egypt. But you try many medicines in vain; there is no healing for you. Why will your warriors be laid low? They cannot stand, for the Lord will push them down. “As surely as I live,” declares the King, whose name is the Lord Almighty, “one will come who is like Tabor among the mountains, like Carmel by the sea. Pack your belongings for exile, you who live in Egypt, for Memphis will be laid waste and lie in ruins without inhabitant. “Egypt is a beautiful heifer, but a gadfly is coming against her from the north. The mercenaries in her ranks are like fattened calves. They too will turn and flee together, they will not stand their ground, for the day of disaster is coming upon them, the time for them to be punished. Egypt will hiss like a fleeing serpent as the enemy advances in force; they will come against her with axes, like men who cut down trees. They will chop down her forest,” declares the Lord, “dense though it be. They are more numerous than locusts, they cannot be counted. “Do not be afraid, Jacob my servant; do not be dismayed, Israel. I will surely save you out of a distant place, your descendants from the land of their exile. Jacob will again have peace and security, and no one will make him afraid. at the sound of the hooves of galloping steeds, at the noise of enemy chariots and the rumble of their wheels. Parents will not turn to help their children; their hands will hang limp. For the day has come to destroy all the Philistines and to remove all survivors who could help Tyre and Sidon. The Lord is about to destroy the Philistines, the remnant from the coasts of Caphtor. Gaza will shave her head in mourning; Ashkelon will be silenced. You remnant on the plain, how long will you cut yourselves?